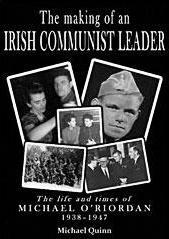 Michael Quinn’s biography of Michael O’Riordan, former IRA member, International Brigader and Irish Communist Party leader for over four decades. Dublin IBMT member Luke O’Riordan has posted a 1971 Irish TV programme (watch here) on his late grandfather, Irish International Brigader Michael O’Riordan (12 November 1917- 18 May 2006), a veteran of the 1938 Battle of the Ebro, whose 75th anniversary is being marked this year. Luke has also posted a recording of his recently deceased mother – and International Brigade Memorial Trust activist – Annette O’Riordan (3 May 1953- 4 May 2013), singing “Pulling Hard Against the Stream”, on 25 January 2002, at the “Tribute to Mick O’Riordan”, a concert organised by IBMT Patron Christy Moore in the New Theatre, Connolly Books, Dublin. See the video here. These postings also provide a link to the address by Luke’s father, IBMT Ireland Secretary Manus O’Riordan, in Liberty Hall, Dublin, at the celebration of the life of brigadista Bob Doyle on 14 February 2009 (video here). This, in turn, provides links to the other YouTube postings by Ciarán Ó Brolcháin, of the International Brigade Commemoration Committee, Belfast, of that marvellous celebration, including the procession of Bob Doyle’s ashes through Dublin city centre, and addresses by then President of the Asociación de Amigos de las Brigadas Internacionales, Ana Pérez, and the then Secretary and current President of the IBMT, Marlene Sidaway.